Cedar Log Yard Swing | CFU19 | Free Shipping! 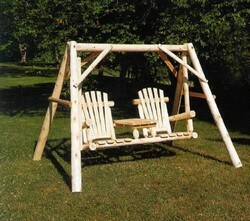 The model CFU19 Tete-A-Tete Swing is made from 100% Cedar. The look of Cedar Log Furniture is rustic, and the feel is solid and comfortable. A by-product of the log home industry, the material in our log furniture is a renewable and environmentally safe resource. Since cedar is naturally resistant to rot and insect infestation, you may be assured of many years of useful service. The natural finish will darken to a silvery gray when left outside to weather. However, a quality exterior grade penetrating sealer may be used for added protection and to maintain the bright appearance if desired. Note: All log furniture can an usually does crack or "check" in various places. This happens as the wood dries. Checking occurs on the surface only and does not affect the structural integrity of the wood; therefore, checking alone is not sufficient reason for a return. Of course, if you are unhappy with your product for other reasons, we will be happy to accept your return within the guidelines of our Return Policy. Carton 1 measures 79" x 14.5" x 7" and weighs approximately 70 lbs. Carton 2 measures 67" x 25" x 5" and weighs approximately 45 lbs. Carton 3 measures 33" x 26" x 13" and weighs approximately 35 lbs.